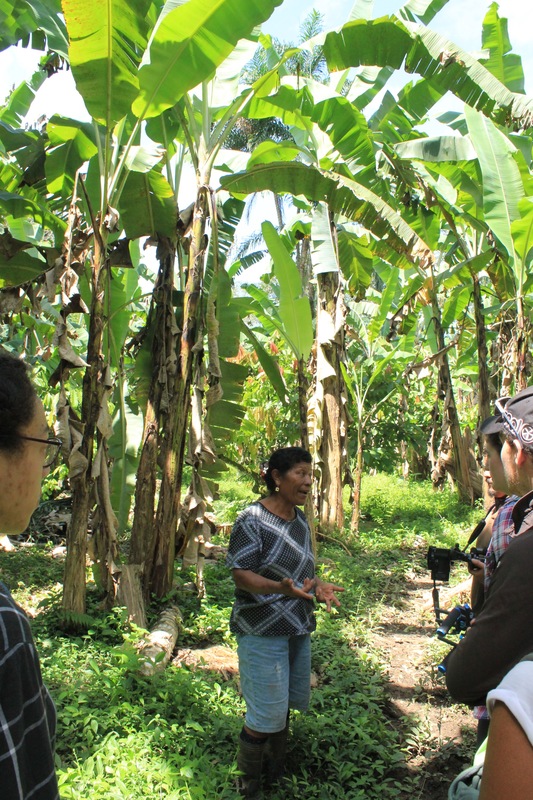 Our visits with the Bribri people of Costa Rica forced us to rethink the role that chemicals play in banana production. Barely a day after Wade’s jungle of Eden, we had swung round the mountains at the speed of the exasperatingly slow lorry we were stuck behind, and were now climbing into a canoe. We had spent the best part of an hour trundling along dirt roads, dodging pot-holes the size of pit mines and lamenting the deposit on our rental cars. Now this dugout canoe (carved from a single piece of tree), tottering in the rapids of a jungle river, was the last step on our journey to meet the Bribri. 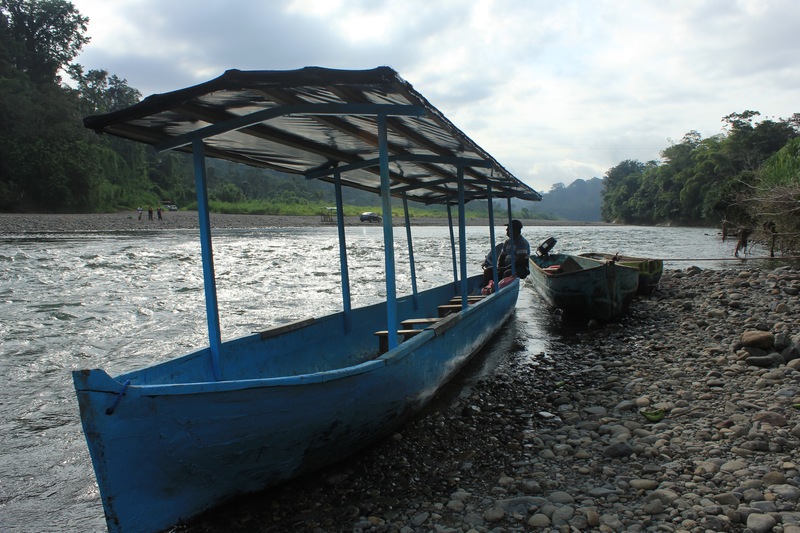 One of the dugout canoes we hired to cross the river. One of the last bastions of indigenous life in the country, the Bribri are a native people of Costa Rica whose history, language and culture stretch back for millennia. We wanted to hear their experiences and their relationship with the West’s favourite frugal fruit. Like many indigenous peoples around the world, the Bribri have been mistreated and disenfranchised by Spanish colonialism, creating a spiral of poverty. Despite their treatment, the Bribri are an extraordinarily friendly and fun-loving people, taking great pride in their culture, religion and language (though thankfully many also speak Spanish!). Our team interviewing Candida, a Bribri farmer. Women play an important role in Bribri society, Candida explained to us. Many of the clans are matrilineal, meaning that only women can inherit land and prepare the sacred cacao drink that is so essential for religious ceremonies and rituals. Our matriarchal contact, Candida, was no exception. Greeting us joyously at the bank, she thrust us into her plantations with barely a ‘how’d you do’. Before we know it we’re wading through bananas, around cacao and under beans. The Bribri take pride in their environment, Candida tells us. They know how damaging pesticide-riddled monoculture plantations are, so instead mix their bananas with other crops, creating diverse ‘agroforests’, free of chemicals. But this comes at a cost – namely, low yields and freedom for pests to roam free. All Bribri live an impoverished lifestyle, living on less than $20 every two weeks, yet most refuse to use pesticides even if it might increase their income. 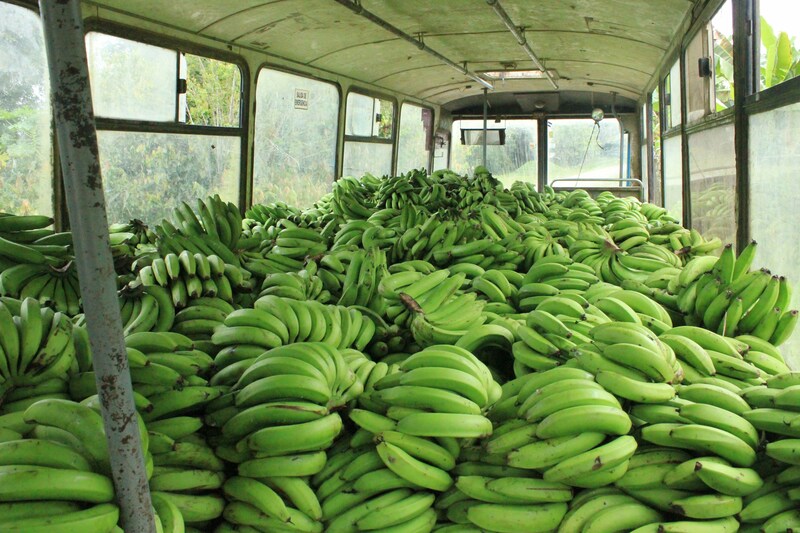 The bus used to transport the Bribri's organic bananas to a packing plant to be made into baby food for a German manufacturer. Trundling into the village we pass thatched houses, dense agroforests, a school on stilts and a vast spluttering bus load of bananas. Every day during harvest season the villagers pool their fruit and fling into this battered vehicle that looks like it was cobbled together on Scrapheap Challenge, and send it to the river. The bus load is bundled into a dugout and forced across the rapids to a huge Trobanex truck (a multinational banana corporation), waiting to carry them to market. 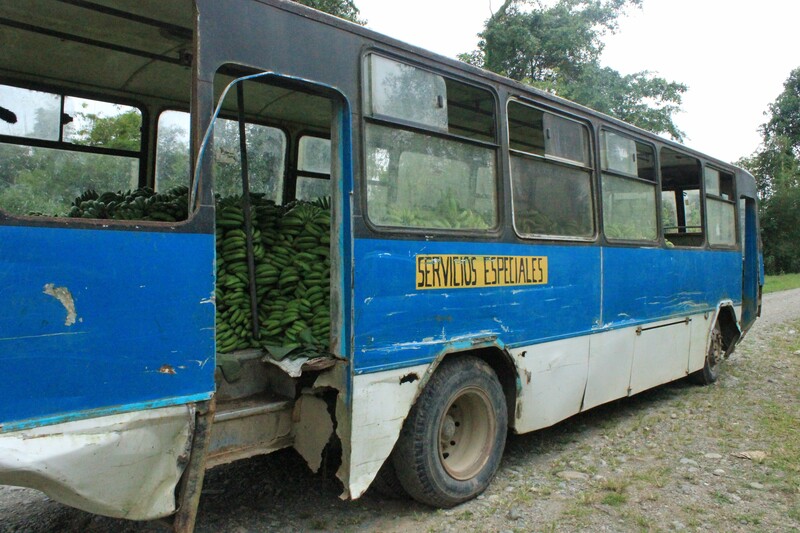 The whole process takes the entire day, with both bus and dugout making several trips back and forth to ferry the thousands of fruit. 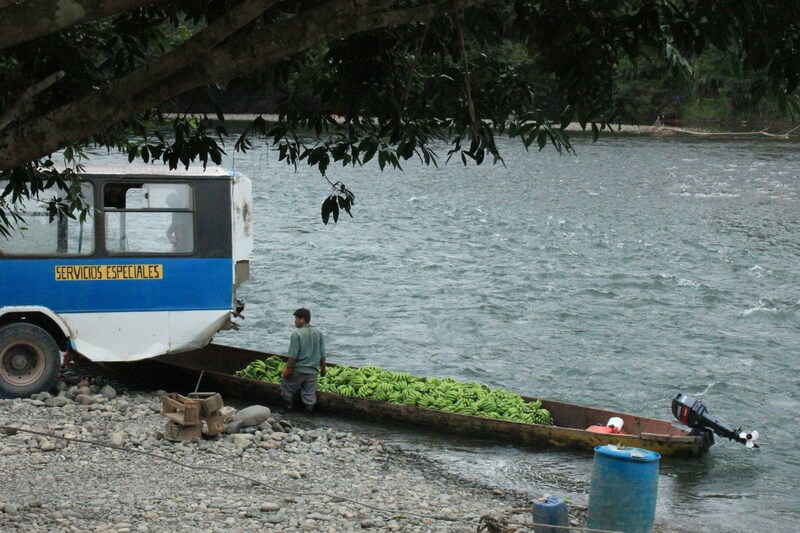 Workers load the bananas from the bus into dugout canoes to cross the river to another vehicle. The Bribri are remote. To put it mildly. But relations with corporations like Trobanex make it possible for the villagers to sell their produce. 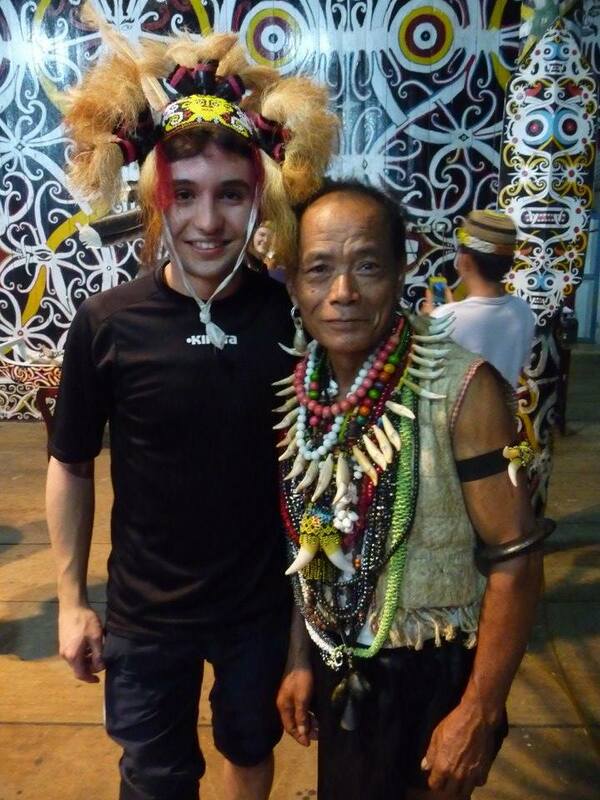 Remoteness also allows them to preserve their culture and heritage. Multi-crop farming is only possible with fertile soil and a balanced ecosystem, which has taken centuries to develop, passed down through the generations. So in many ways, their integrated, chemical-free approach to farming is a way of connecting with their ancestors, and preserving not just their environment, but their culture and heritage as well. We have a lot to learn from them in the West, and we’d better do it fast. Oscar has a background in agroecology, rock climbing and dessert-eating. Having worked with the Food and Agriculture Organisation of the United Nations he has experience in food security management and working with farmers in developing countries. He is most interested in meeting the plantation workers affected by the cultivation issues, hearing their views and understanding how this project can help improve their lives.